HigherEdMe is free to use for students and futur students who are looking to study abroad. What do you do with my profile’s information? We don’t sell it. We don’t publish it without your agreement. And for each time a school is interested in you, we ask you before sending your contact information. How I am connected to Schools and Universities? When you create an account on HigherEdMe, you have to answer a series of questions that will create your first study abroad wish. This wish is published on the ‘School’ side of HigherEdMe. It’s mean that the Schools and Universities registered on HigherEdMe can see it. If your wish and profile is a match for them, they can contact you through HigherEdMe with a message called ‘offer’. You are interested = your contact information is sent to the school who contacted you and the school will contact you directly a bit later. How do Schools and University find me? Schools and university have dedicated accounts that allow them to see published wishes. They can filter them by destination choice, or study fields for example. If they want they can find more information about a student with his profile. For the time being, HigherEdMe offers no scholarship to go abroad. We have hope to create one in the future. Don’t worry, when it will happen, you will be alerted. To help students that need one, we have created a website dedicated that list Scholarship tweets in all the world. How to find a scholarship? Go to www.thescholarsheep.com, and discover our dedicated twiter account about Scholarships. The budget is an important matter for a lot of Schools and Universities. We ask you to declare the amount that you actually have in your possession, or that you know you can have without any scholarship (except if you already have the scholarship confirmed). Don’t be afraid to declare a law budget, we have schools that offer scholarships that will contact you. We don’t know. HigherEdMe isn’t in charge of those questions. It is different for each school and university registered on our platform. Schools and Universities from all over the world are registered on HigherEdMe. When creating your wish, you can select a continent and then a country but it’s not an obligation. HigherEdMe’s goal is to offer to you the more chances to go abroad, so we can only advise you to limit you to one country and to broaden your view! You can make multiple wishes, at least 3. Use those 3 wishes wisely! I want to study in a specific country, how can HigherEdMe help me? On HigherEdMe, you can select a specific country in your wish, but we don’t limit the offers that you will receive from this country. Our goal is to give you the more chances you can have to go abroad and to compare programs and potential schools to make the best choice possible for you. Maybe you will be lucky and receive offers that will match your wish. 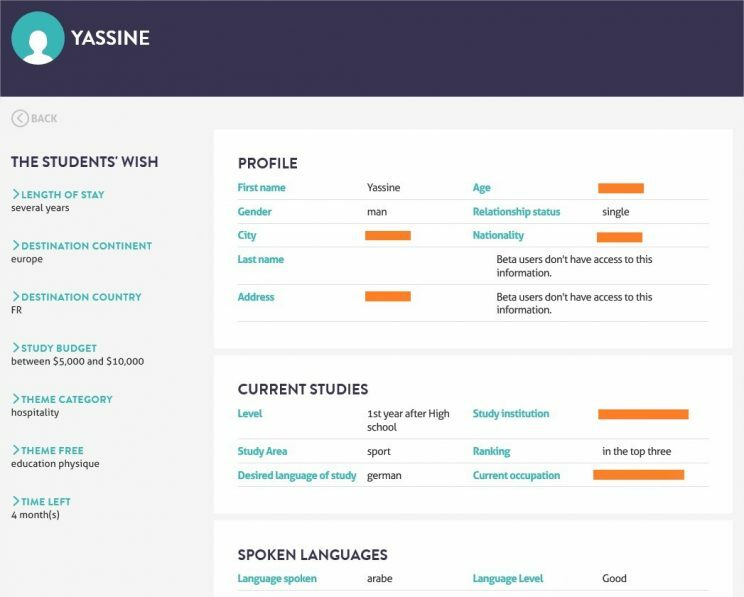 Remember, HigherEdMe is completely free to use and you can create up to 3 wishes and choose to go anywhere in the world, on a specific continent or a specific country. Can I use HigherEdMe, if I don’t know where to study? When you create your study abroad wishes, you can choose anywhere to answer the question where you want to study. This question has 3 levels of precision: anywhere – a specific continent- a specific country. You can make 3 wishes with three different destination choices. Which study fields are available on HigherEdMe? I wish to study a specific field when I’m abroad, what I have to do? When you create your study abroad wish you can choose between 14 categories of study fields and if any of them match with your choice, you can select ‘other’. The next question gives you the opportunity to precise with your own words what you want to study or which degree you are looking for. So if you are looking for a specific program, it’s simple, just write it in your wish, you can also explain your choice in the motivation part of your profile later. Can I create a wish, if I don’t know what to study? I want to study in a specific School/University, how can HigherEdMe help me? On HigherEdMe, at first, you can’t choose a specific University or School to be in contact with. The first step is up to the Schools and Universities. If you already know where you want to study, and it’s nowhere else. Go, contact them directly, you don’t need us. But if you want to have alternative choices, HigherEdMe is there for you! Like tuition fees, this matter depends on each School and University. They all have their own criteria and way to select students. Once you’re in contact with them, they will tell you what is required to follow their programs. If you have doubt or questions, don’t hesitate and ask them. You can find some pieces of advice on our blog here.